18" x 9.5" x 9.5"..
Tough durable multi-putpose toolbag Heavy duty polyester construction with reinforced backing PVC ..
Tool Bag Hard Base 16"
Made from heavy-duty polyester with a reinforced back and featuring a wide top opening and hard base..
Stanley have pulled out all the stops to bring you a state of the art portable organiser for safe an..
Electricians tool case. A frame free-standing tool case. Full zip opening on both sides. External.. 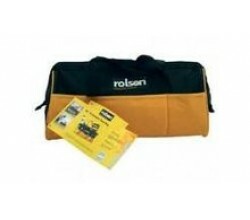 This compact drill bag has comfortable cotton-padded handles while a 6 mm rubber foam reinforced bot..